A few of you asked what nail polish I was wearing in this post, so I thought I’d put up a proper NOTD post to show it properly. Following conversations with some of you U.S. girls, I’m thinking that this particular line of L’oreal polishes might not be available over the pond. Maroon Sorbet is such an odd name for something so dark and vampy… sorbet always makes me think of summer! 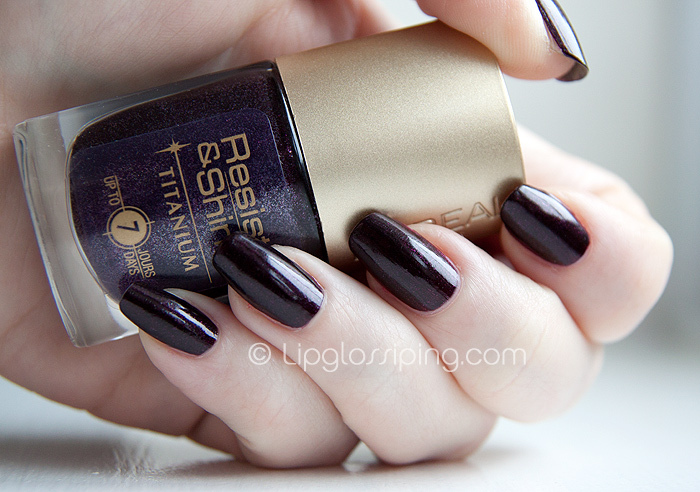 The shade itself is a blackened purple with ‘hidden’ shimmer. You may be able to make out a speck of the shimmer on my middle fingernail but it’s really quite subtle which is a shame as a little more visibility would have given this shade the lift it needs. No complaints here about wear or application – it’s a solid high street polish that won’t break the bank! L’oreal Resist & Shine Titanium Nail Polish in Maroon Sorbet is priced at around £6 and available at most L’Oreal stockists including Boots. It’s a very pretty color, though I too would like it better if you could see the shimmer better. I can definitely see the shimmer. Lovely polish. On 11th feb you posted your nails which were very short. In the entry posted today (13 feb) your nails are twice as long. What do you use that they grow so fast??? Men of the World. Y U No Smell This Good? Share a bath with someone you love!